As Chance the Rapper had previously hinted it would be, Donnie Trumpet and the Social Experiment's Surf was dropped with little warning tonight. 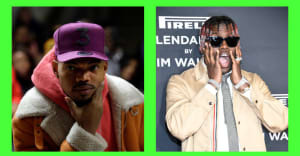 The project—which Chance has been adamant is not a Chance album, telling The FADER earlier this year that, "Surf is [Nico Segal aka Donnie Trumpet]'s project"—features a diverse cast of contributors, including B.O.B., BJ The Chicago Kid, Busta Rhymes, J. Cole, Janelle Monáe, Jeremih, Big Sean, Raury, D.R.A.M., Quavo, King Louie, Jesse Boykins III, Erykah Badu, and Jamila Woods. Download the album for free from iTunes, and revisit The FADER's recent cover story on Chance and the Social Experiment.